The National Center’s Risk Analysis Director, Jeff Stier, tells me that e-cigarettes may soon be banned in the United States. This will set up a ludicrous situation in which e-cigarettes, which deliver nicotine to users without cancer-causing tobacco carcinogens or any smoke (including second-hand smoke), are banned, while tobacco cigarettes are perfectly legal. E-cigarettes, as most of you know, are electronic nicotine-delivery devices that look like tobacco cigarettes, and which are inhaled like tobacco cigarettes, but don’t contain tobacco. They emit water vapor, but no smoke. The advantage of e-cigarettes over tobacco cigarettes is that they don’t contain, and thus don’t burn, tobacco. Tobacco cigarettes cause cancer because of the carcinogens a tobacco cigarette smoker is exposed to when tobacco is burned. Jeff tells me the FDA is expected to issue a rule, known in the regulatory businesses as a “deeming regulation,” that could ban all e-cigarettes that began sales after February 15, 2007. That’s almost all of them. Various nanny state organizations like the idea of banning e-cigarettes, because they don’t want people to inhale nicotine. They also don’t want young people using e-cigarettes. While it is inarguable that young people won’t use e-cigarettes if e-cigarettes don’t exist, we are faced with the ludicrous notion in the United States today that e-cigarettes, a nicotine-delivery device much safer than tobacco cigarettes, will be banned, while tobacco cigarettes won’t be. Even more ludicrous, e-cigarettes could be banned against a backdrop in which marijuana cigarettes are increasingly made legal. I’m told marijuana cigarettes are even more carcinogenic than tobacco. In the end, though, it comes down to this: who decides? 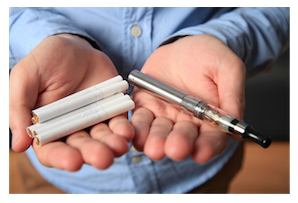 Do you want the option of e-cigarettes for yourself or your friends and family who may be addicted to nicotine? Or do you want the federal government to take that choice away from you, effectively steering you toward tobacco, unless you quit nicotine outright? Next Wednesday, the House Appropriations Committee may take steps to tell the FDA not to ban e-cigarettes. If you have an opinion on this, let the members of that committee know. This is one of those moments in which the public has the opportunity to make a difference, because not many people know that e-cigarettes may soon be banned. Those who get in touch with the Appropriations Committee’s members will likely be among the very few people they hear from.